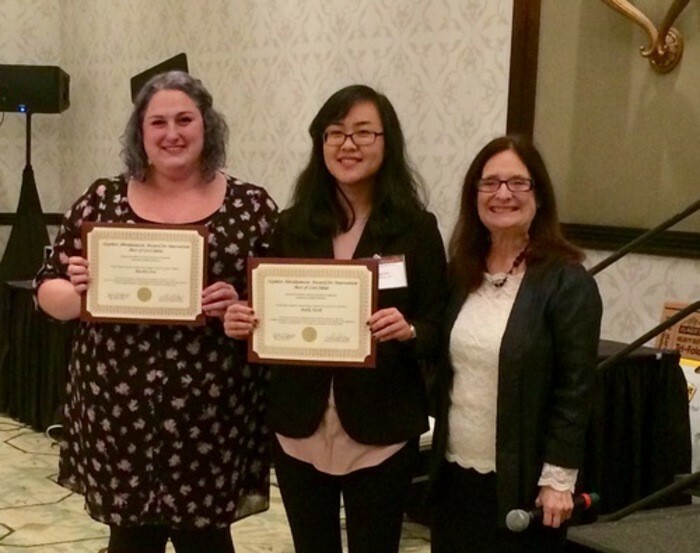 First-year grad student Rachel Fox and her collaborator Kelly Park (USC) were given an award for research methodology by the organizers of the Innovations in Medical Education (IME) conference Transforming Health Professions Education through Innovation, hosted at USC’s Keck School of Medicine. Her project, “Weight Stigma Reduction Among Medical Students Through Narrative Medicine,” is part of a co-facilitated project between Rachel and Kelly Park, Rachel’s co-PI. Project: A narrative medicine curriculum for medical students to reduce anti-fat stigma and increase empathy for the experiences of fat patients. Abstract: Public health concern about the “obesity epidemic” has led to increased research about the multifactorial causes of weight gain; this new research demonstrates that many of the negative stereotypes about fat individuals are not only offensive but scientifically inaccurate (fat used herein as a neutral descriptor in solidarity with the fat activism movement). However, stigmatization of fat individuals persists among medical practitioners, a group with access to the data that refute these negative stereotypes and an obligation to provide respectful, evidence-based care to all patients. Alarmingly, studies indicate that younger age is a strong predictor of anti-fat bias among health professionals. Furthermore, “morbidly obese” patients have been shown to be the most common target of derogatory humor by both medical students and attending physicians. Thus, it is imperative that interventions to reduce fat phobia take place in undergraduate medical training prior to contact with patients. Narrative methods such as theater, creative writing, and film-making have emerged in recent years as powerful tools for such interventions. This intervention will be designed for groups of 5 to 10 medical students and 5 to 10 non-medical participants who will meet 6 times for 2 hours per session. Each student will be paired with a fat person who has experienced medical discrimination based on their size. Facilitation of each session will be shared by the investigators and experts recruited from disciplines such as sociology, nutrition, fat studies, and literature. Participants will be given the option to publish their works on a webpage created specifically for this workshop series.